Department of Cundinamarca (Departamento de Cundinamarca, [kundinaˈmaɾka]) is one of the departments of Colombia. Its area covers 22,623 square kilometres (8,735 sq mi) (not including the Capital District) and it has a population of 2,598,245 as of 2013. It was created on August 5, 1886 under the constitutional terms presented on the same year. Cundinamarca is located in the center of Colombia. The name of Cundinamarca comes from Kuntur marqa, an indigenous expression, probably derived from Muisca and means "condor's nest", it was used in pre-Columbian times by the natives of the Magdalena Valley to refer to the nearby highlands. Most of Cundinamarca is on the Eastern Cordillera (Cordillera Oriental), just south of Boyacá, bordered by the Magdalena River on the west, reaching down into the Orinoco River basin on the east, and bordering on Tolima to the south. The capital district of Bogotá is nearly completely surrounded by Cundinamarca territory and was formed by carving up Cundinamarca. Because of this and other border changes, the present department of Cundinamarca is much smaller than the original state. Whites and mestizos (96.28%): Mestizos are mixed European-Amerindian blood. The Bogotá metropolitan area has a history of European (not limited to Spanish) and other Latin American immigration. East Asians (0.01%), often of Chinese descent. About 25,000 Chinese-Colombians live in the department. The city of Bogotá and the municipalities of Soacha, La Calera, Cota, Chía, Madrid, Funza, Mosquera, Fusagasugá, Facatativá and Zipaquirá form a single metropolitan area. 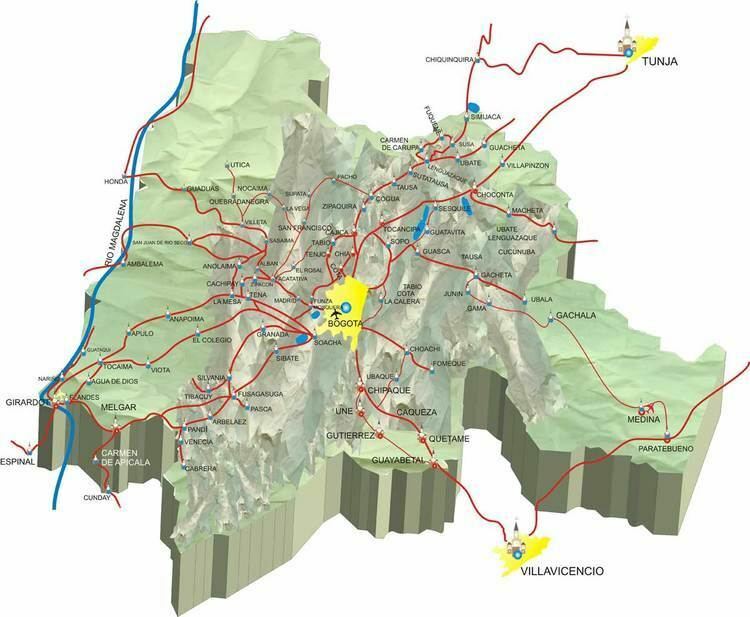 Cundinamarca is made up of 116 municipalities, six of which recorded a population of over 100,000 and could be considered as cities: Soacha, Fusagasugá, Girardot, Facatativá, Zipaquirá and Chia, while Bogotá District is in the category of capital. Bogotá Metropolitan Area: Comprises the towns of Soacha, Facatativá, Chia, Madrid, Funza, and Mosquera, among others. Its activities are centered in the industrial sector. Estate activity is important especially in the suburbs closer to Bogotá: Chía, La Calera and Tocancipá. Girardot: In the far southwest and bordering Department of Tolima, is the capital of the Province of Alto Magdalena. Its main economic activity is trade, as a result of a major tourist dynamics and its proximity to major agricultural areas of Tolima. It has a college and important trade fairs and events. 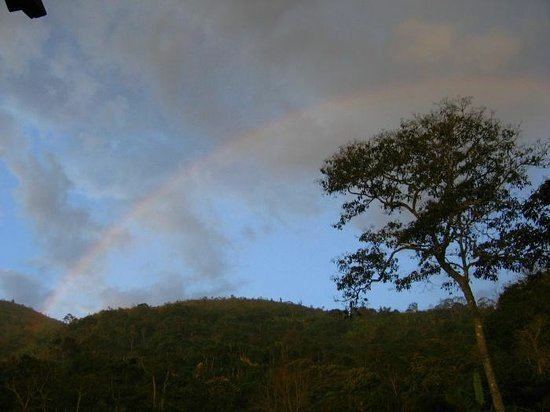 Fusagasugá is located between Bogotá and Girardot, and it is an hour of each city. The capital city of the Province of Sumapaz, it is an important focus of agricultural marketing and regional services, standing out as an educational city with a large university and an increasing population trend. Its economy is mainly focused on trade and agricultural marketing, with a significant production of ornamental plants and flowers for export, for which it is known as the garden city of Colombia. Zipaquirá: Despite being part of the metropolitan area of Bogotá, it has managed to position itself as one of the most important centers of Colombia's salt mining industry. Its economy is focused on commerce and services. Other major towns are Ubaté due to high livestock and dairy production. Guaduas, is an important cultural center. Chocontá and Fred are agricultural centers. Cundinamarca has 15 provinces and the Capital District (Bogotá), which simultaneously acts as capital of the Republic, capital of the Department and a separately administered District (or Department) in itself. The department is home to the basketball team Cóndores de Cundinamarca, which plays its home games in the Coliseo de la Luna in Chía.